Dhruv had the most liked content! Jan, this may be the case in Europe, but the overwhelming Nextgen push in the US has been towards Optimized Profile Descent arrivals which essentially require accurate VNAV in order to fly. These procedures are VNAV-dependent to the extent that CRJ/ERJ operators often file ASAP reports due to not being able to comply with the procedures as published due to the Advisory VNAV being insufficient. The overwhelming doctrine even at Southwest during the waning days of -300 operations was towards using VNAV on these arrivals more and more, despite Southwest being one of the more automation-resistant operators in the past due to a desire to maintain commonality with at one point a 3-family fleet. Private Pilot training for less than $10k in a G1000 C172 is a steal. Enjoy! I suspect the trends have shifted slightly since 1997, especially in the US as more and more "Optimized Profile Descent" (OPD) STARs are becoming the norm. These newer procedures have specific block altitude and speed restrictions on multiple successive fixes and can't be flown without at least some sort of advisory VNAV at minimum generating a descent path that complies with the restrictions. Had someone already claimed the jump seat?! Arizona One is on my list. I should have it ready sometime early September once I'm back from vacation. This is N352SW, c/n 24888, a 737-3H4 which first flew Oct 17, 1990 and was delivered to SWA Nov 6, 1990. Southwest introduced its second special livery, Lone Star One, in celebration of the airline’s 20th anniversary. 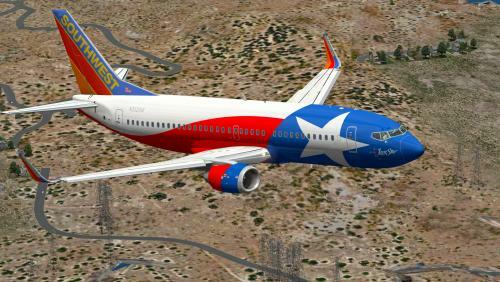 This 737-3H4 was painted with the Texas state flag as a tribute to the airline’s home state and the ten Texas cities it serves. Ship 352 wore the carrier's original "Desert Gold" tail until July 2003, when it was repainted with a tail representative of the "Canyon Blue" colors. Lone Star One was retrofitted with winglets in mid-2010, and was retired from service on May 17, 2016. The livery is slated to be repainted onto a 737-700 later this year. To install, unzip into the "Liveries" folder. In the US the AIM now recommends transponders set to ON/ALT while on all movement areas, ASDE-X or not. 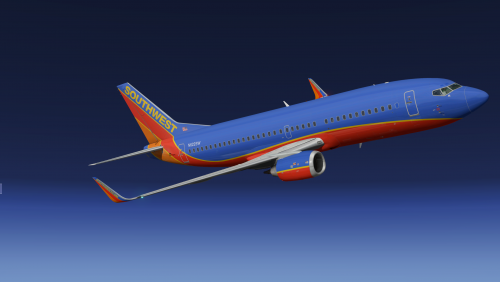 Welcome to the first in a series of Southwest 737-300 repaints for the excellent IXEG 737 Classic! This is N622SW, c/n 27932, a 737-3H4 which first flew Mar 12, 1996 and was delivered to SWA Mar 20, 1996. Ship 622 was originally painted in the carrier's original "Desert Gold" livery and repainted into "Canyon Blue" colors in early 2006. She received retrofit winglets in early 2008, which are reflected on this repaint. As yet this aircraft has not received Southwest's new "Heart" livery. To install, unzip into the "Liveries" folder. Who want's to fly a Real 732 Sim for a good cause? I may be very interested in this if the dates line up! Indeed! We see this all too often on VATSIM where pilots will blindly "plug and chug" into their FMCs without correlating the FMS data to the charts. One of the biggest things we do in a crew environment is cross-check the FMS entered flight plan with the planned or cleared route, and then also re-verify any SID/STAR restrictions or approach restrictions with the plate. Here's the EDBC ILS in question, as others have posted, you can see that the altitude at the OM fix is actually 1930'.